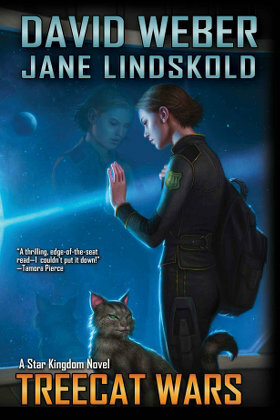 Treecat Wars is the third novel in the Star Kingdom series of annual Young Adult s-f novels by David Weber and Jane Lindskold, following A Beautiful Friendship (reviewed here on October 10, 2011) and Fire Season (review October 26, 2012). These are the prequels to Weber’s immensely popular Honor Harrington series of military science-fiction, set about 350 years earlier, when the planet Sphinx is just being settled by humans. In A Beautiful Friendship, Honor’s ancestor Stephanie Harrington, then an 11-year-old precocious tomboy, discovers Sphinx’s six-legged empathetic treecats, and bonds with the one she names Lionheart, but whose own name is Climbs Quickly. In Fire Season, Stephanie and Climbs Quickly are hard-pressed to keep the secret of the treecats’ intelligence during Sphinx’s dry season, when raging forest fires threaten to wipe out whole treecat clans. As before, Treecat Wars is primarily Sphinx’s human settlers’ story, centered around now 15½-year-old Stephanie Harrington and her family and teenage friends. But there are enough scenes with Climbs Quickly and the treecats to satisfy Flayrah’s readers. Riverdale, NY, Baen Books, October 2013, hardcover $18.99 (376 pages), Kindle $7.99. 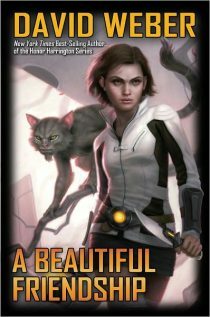 Weber gets a co-author in this second of Baen Books’ series of Star Kingdom books for Young Adults, and the sequel to Weber’s A Beautiful Friendship, reviewed here last October. This new series is a prequel to Weber’s immensely popular Honor Harrington series of military science-fiction. This new series is set about 350 years earlier, when the planet Sphinx is just being settled by humans. In A Beautiful Friendship, Honor’s ancestor Stephanie Harrington, then an 11-year-old precocious tomboy, discovers Sphinx’s six-legged empathetic treecats, and bonds with the one she names Lionheart, but whose own name is Climbs Quickly. 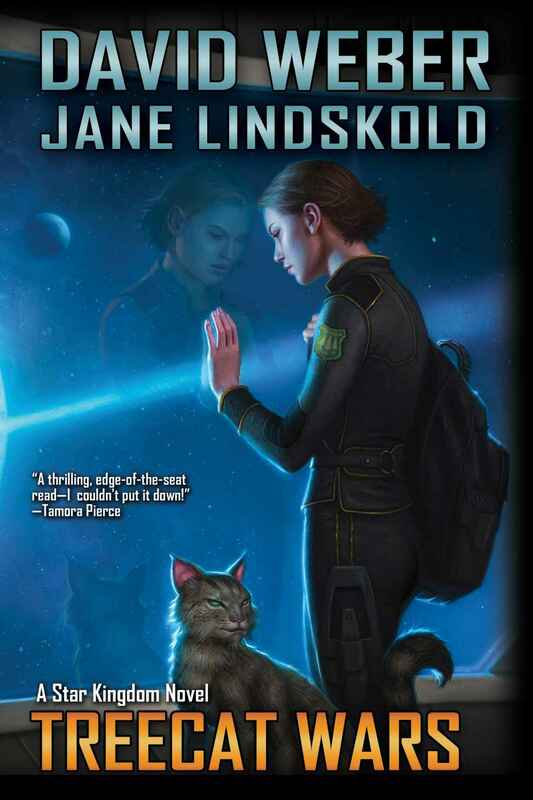 The (almost) equal time given to the treecats, who are background characters in the Honor Harrington novels, is what makes this series anthropomorphic. Despite their name, treecats were not all that feline. For one, no Terran cat had ever possessed six limbs or a fully prehensile tail. Their build was longer and – beneath their fluffy coats – leaner. They were also larger, averaging sixty to seventy centimeters through the body, with their tails doubling the length. And, of course, no Terran cat had three-fingered hands with fully opposable thumbs. Yes, but this story isn’t entirely new. In January 1998, Baen Books published More Than Honor (review; YARF! #58), an anthology of three original novellas by different authors set in Weber’s “Honor Harrington” universe. The lead novella was Weber’s own “A Beautiful Friendship” (pages 3-132), the beginning of this same story. It appears with minor expansions, retitled as “Unexpected Meetings”, as chapters 1 through 12 (pp. 3-129) of this novel. The second part, “With Friends Like These…” (chs. 13-29; pp. 133-352), is an original sequel. 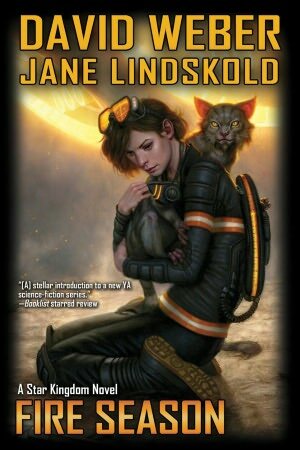 This rewritten novel version is the first in Baen’s new Star Kingdom series of Young Adult s-f books.